Ok I’ll level with you. I’m obsessed with face stuff. Packs, masks, scrubs the whole shebang. So there’ll be a fair amount of this here I reckon. I think the simple matter of cleaning and exfoliating your skin is the key to keeping it fresher, healthier and looking younger. Skipping this part of your regime is like skipping a meal, yeah, you can get away with it but ultimately its unhealthy and you will pay for it at some point! Be warned! At £35 for 50ml tube and £55 for 100ml jar it ain’t cheap but does last quite a long time. Most people I know you try it, love it…but there are some serious naysayers and they raise a few points regarding chemicals and the like that are always worth a listen and a bit of thinking about. As with everything in life we should just accept what we are told. I believe, especially, when it come to your health you should always, always do a little investigation. So here’s mine. Make of it what you will, but most of all make your own mind up. Great! I’d agree. If you need to give our face a pick-me-up after a night of debauchery or just bad temper maybe? Or drinking or lack of sleep? Or over work or sadness? Then this will save you! A trip to John Lewis is never wasted I say!! 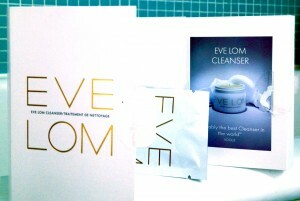 The more than fabulous lady at Eve Lom gave me a full and thorough going over! Hello vicar… She made a good point (good from her point of view, anyway) which is that I should try the mask as part of the process that EL suggest to truly test it’s merit. I agree under these circumstances of trialing and reviewing, BUT I do think that products should stand alone too, as not all of us want to use a single range and I think many of our routines and product choices have grown organically from trial and error. We like what we like however open we are to new things; the tried and trusted is our mainstay. 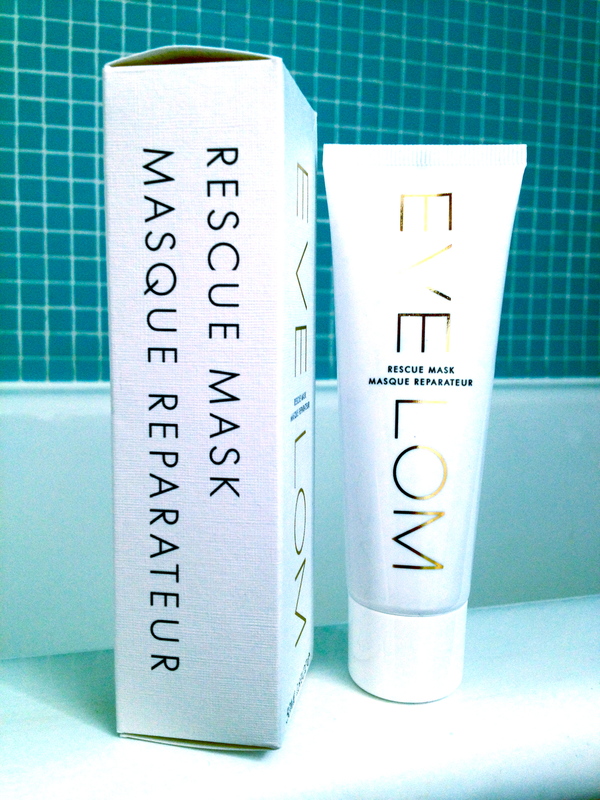 But nonetheless in the spirit of fairness I’ll give the mask a go in conjunction with the recommended (legendary) cleanser and seven (seven?!?) step routine. 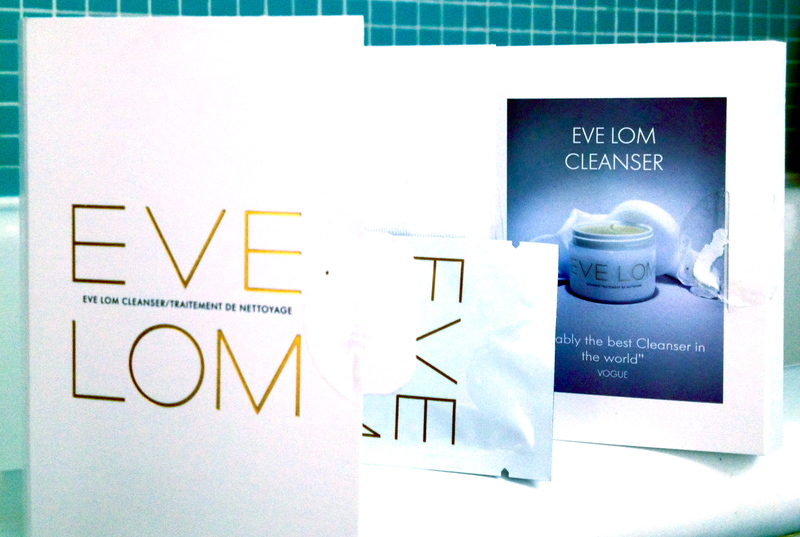 Anyway the divine EL lady gave me the cleanser as a sample (complete with its own mini muslin cloth!) so it’d be churlish of me not to try it. For EL it’s all about a seven step routine of pressure and the like – all outlined on the afore mentioned, impossible to read instructions. Quite jolly once you get into the swing of it and I like the idea that I might ‘drain my congested areas and eliminate toxins.’ Sounds terribly useful…! The cleanser makes me nervous though as it’s basically a load of oils, clove (to purify), eucalyptus (to drain away toxins), hop (to tone) and chamomile (to soften and condition) and a mineral oil that I assume it’s all suspended in, and as I’m prone to a bit of greasiness it seems illogical to smear even more on my face. This is why the hot water and muslin cloth element is important. It’s this procedure that will minimize the residue of any oils. I have to say the cleanser did make my face feel good and really clean and not remotely oily (it is designed to completely rid your face of make up so had an easier job with my make up free face. What?!? No, the day for night cover up does not count! BUT I didn’t apply any nighttime moisturizer as I was nervous of the multiple grease possibilities. My face was far from dry in the morning so I think that may have been a wise move. So, back to the mask…the following night I used the cleanser again (seven steps need planning – it’s not for the impatient and time inefficient – but it is your health and dewy youthfulness we are safeguarding here so what is a few minutes effort worth to you?) 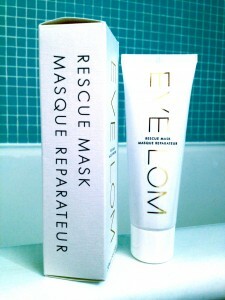 and then applied the Rescue Mask. I then went to watch an episode of Modern family and, frankly forgot about it. When it dries out it is no longer working so no harm done except for the ‘face-dandruff’ that I was dropping everywhere! The lady at the John Lewis EL counter said I should I rub the dry mask off for extra exfoliation so I did that (I’m very biddable). And the results are in…the texture of the skin is smooth and soft, a brighter, more glowing colour is present (could just be from the rubbing and warm water?!) and everything looks chirpier and fresher, positively bursting with youthful healthiness! Hoorah. Even the next morning it still seems pretty damn good! Glycerin – used in many beauty products to create a smoother texture, soften the skin and attract water. It naturally attracts water so can be useful in keeping moisture in the skin and pulling it from the deeper layers to the surface. A mixed blessing I’d say. A little sounds good but too much can over dry the skin to the point of blisters even! Honey – is a natural antibacterial and antiseptic (but only truly if it has not been pasteurized or treated). For skin – It produces hydrogen peroxide when mixed with water and that is a mild antiseptic – great for minor cuts and the like. It hunts down free radicals, holds in moisture and has a mild AHA (Alpha Hydroxy Acid) in it, which is an acid that breaks down the chemical bonds holding the skins (dead) cells together making them easier to scrub and wash away. I’m guessing that’s why it’s included here…for all the above! Sweet Almond Oil – generally considered a very useful and very safe ingredient in beauty treatments due to its rich vitamin content (A, B1, B2, B6 and especially E). It’s easily absorbed so it’s moisturizing and nourishing qualities are especially lauded. If true, all very good for the anti-ageing process! Phenoxyethanol – ooh now we are getting into the nitty gritty! I mentioned parabens ealier and this I reckon has been added as an alternative. Therefore I assume it’s here as an anti-bacterial (also anti mould and yeast) and preserver. It’s just about everywhere in products these days but there’s a lot of arguing over its safety too. So read up! I see that under 1% is considered okay but many products (like this one) don’t list amounts. Camphor – it cools and disinfects and is used in moth repellent, Asian sweets, fireworks, embalming and is a mild anesthetic and antibacterial (think Vicks VapoRub). It’s used to soothe irritated or red skin, and it has a nice smell (if you like that sort of thing). I think it causes the slight ‘heat’ ‘menthol’ feeling as it’s rubbed into the skin and…er…it’s a little bit poisonous so don’t eat it! Magnesium Aluminum Silicate – this is a mineral derived from clay and is often used, and considered safe, in beauty products as a thickener and filler. It’s large molecular structure means it doesn’t get absorbed into the skin (but do have a look at the wrangle regarding the dangers of Aluminum and other ‘heavy’ metals found in the products around us). Calcium Chloride – similar to table salt (Sodium Chloride – see below) this ‘salt’ is used in food to preserve its texture and shape. It’s also used in sports drinks as an electrolyte and on the roads to stop the snow or ice sticking! In beauty products, and therefore I suppose here, it is used as an astringent (constricts the pores) and thickener. Aluminum Chlorohydrate – is an aluminum based salt. Its primary use is as the anti-wetness protection element in antiperspirants. 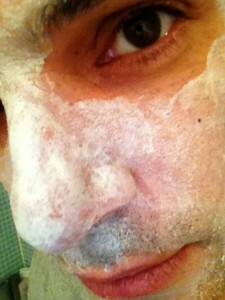 Hmmm…so it’ll tighten and tingle my face skin….? It is also used to clean water by making its impurities come together so maybe that’s its use here…? Allantoin – is said to have a healing effect on skin. Skin that is sore, chapped, burnt, erupted and generally irritated! It encourages it to form new and healthy tissue and soothes and moisturizes as it goes. Subsequently it’s in loads of products from anti-acne and shaving to hair care, deodorants and foot creams. Well, that’s something to think about isn’t it? I wonder sometimes if a little information is more dangerous than none. And regardless of the whole ‘products designed for women or specifically for men’ wrangle I’ll continue using this product, no doubt, but it does mean that now I’m a tad more armed with some knowledge of what’s what within this product I’m smearing directly on to my most sensitive skin (face that is…oh stop…) AND if a new study proves or claims that there are issues to consider regarding any of the above ingredients, at least I’ll know it applies to me and I’ll think on! I never knew that about honey… though I did once meet an ancient and still stunning actress with a fabulous accent and lots of scarves and lipstick and she swore by rubbing herself with sea salt and honey in the sauna. She looked good enough to want to try it…..